Grilling brats, or Bratwurst seems easy on the surface. But who hasn't experienced your brat exploding and splitting halfway through the grilling process? I have perfected the fail-safe cooking procedure which will guarantee you a grilled beer brat that is juicy and good enough for a food magazine photo-shoot. The instructional video below will lead you to the promised land of an onion smothered beer brat which will make you the grilling king in your neighborhood. They will probably think you were born in Wisconsin, the domestic capital of beer brats. You will have mastered the art of grilling brats. This recipe is perfect for 8 to 10 bratwursts. Trust me, grilling brats will be a breeze if you follow these directions. 1. Peel and slice 4 sweet yellow onions. 2. Fill a large pan with 3 beers (up to you the flavor) and 36 ounces of water. 3. Place the sliced onions in the beer / water mixture. 4. The Secret: Pierce each brat 6 times with a fork. 3 times on one side and 3 times on the opposite side. I will cover this in more detail, as it flew in the face of what I had been taught. 5. Bring the beer / water / onion mixture to a gentle boil. 6. Add the pierced bratwursts. 7. Slowly boil for 15 to 20 minutes. Let's address "The Secret." I was always told you should NEVER pierce meat before grilling, so I never pierced my bratwurst. However, they always ended up splitting. I determined it had to be the steam building up inside the casing. So I pierced the brats with a fork. My theory was that the holes would allow enough steam to escape to keep the brat from exploding, and it has worked to perfection each time. "But what about the juices you are losing from the piercings," you might be asking yourself? I figured a lot more moistness is lost when a brat splits wide open on the grill as compared to little puncture marks that you can hardly see. Pull the cooked bratwursts out of the pan and place on a plate. Pull the onions out and place them in a serving bowl. Discard the beer / water mixture. Grill the brats over direct heat (gas or charcoal works fine) just long enough to add color and texture. Remember, the brats are already cooked, so don't overdo it. Place grilled brats on a bun and smother them with the cooked onions and any other condiment of your choosing. 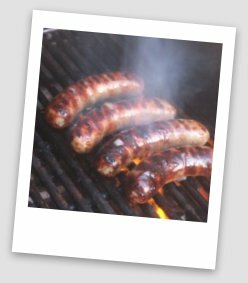 Enjoy these authentic grilled beer brats! Leave Grilling Brats and Return to BBQ My Way Homepage.